Everyone knows that Marilyn Monroe was a blonde bombshell. However, few of us knew that she was greatly responsible for Ella Fitzgerald’s career. I heard the story about Marilyn for the first time on my drive from Miami to the Florida Keys yesterday. Our friend Bobby Williams told us about it, but I just didn’t believe it at first. I decided to Google it and a bunch of stories appeared that confirm what Bobby said. Bobby also texted me the story from KPLU. You can read it here. During the 1950s, Ella experienced a lot of bigotry because of her race. African-American people were limited to a few venues in the country. Ella wanted to perform in the popular Mocambo night club in Hollywood. That’s where Frank Sinatra got his start. Like many other clubs, Mocambo was restricted. 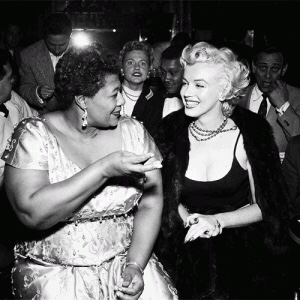 Marilyn was a big Ella fan. When she heard that Ella was rejected by Macambo, she made a call to the club’s owner requesting that Ella be booked for a week. She told him that if he would oblige, she would show up every night of Ella’s run. Since Marilyn was such a huge superstar, her presence would guarantee a huge audience turnout and headline press. The owner said yes and Marilyn kept her word. Ella never had to work a small venue again. The whole world opened up for her. What does this have to do with the digital world? Absolutely nothing. I just wanted to share it with you. This entry was posted in digital, senior lifestyle, tech and tagged ella fitzgerald, Marilyn Monroe by loiswhitman. Bookmark the permalink. Sadly Ella’s story was similar to that of many of the great jazz/swing black artists of the 40’s and 50’s, but thankfully, before most had passed on the doors and recording studios did open up to them. Louis Armstrong’s early Jewish connections were another interesting story of that era.